Description: The giftbox unwraps to reveal… Claw's legendary magic hood. I think there needs to be a spot for dragonslayer helm(beta version). currently, there is none. Should i make a note saying there was a beta one no longer availible, or not? The current description for Medusa Curse in the Wiki is: Your head is morphed into Medusa! The full description on mine is: Snakes for hair and eyes that turn mortals to stone! Your head is morphed into Medusa! I added the corrections to Medusa Curse and Reindeer antlers. 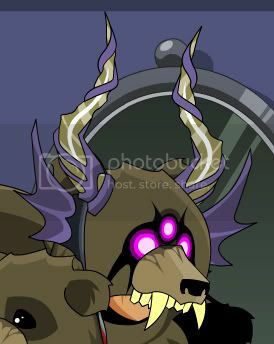 I didn't know where to put this, and I didn't feel like making a new thread for this, but the picture of the Chaos Bear Head is not loading for me (unless the picture was removed from the original source).